My apartment is in the dead centre ! MARAZUL is comprised of only 72 exclusive apartments arranged in a 'V'-shape, designed in such a way that each apartment is provided with the intimate privacy that you may expect from a private villa, but with the stunning views and impressive facilities that you may not. The open end of the 'V' is purely beach & sea! Within the 'V' is a totally unique area of exuberant and colourful tropical gardens, and inside that lies an inner world of spectacularly sculptured swimming pools, beautiful stone statues, a dozen fountains, cascading waterfalls, a vast overflowing bowl, mini-tropical-islands, underwater jacuzzi deck-chairs, thatch-roofed cabanas, and a pool bar. 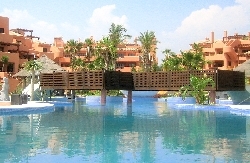 All my guests have unlimited free access to our indoor leisure club, which is an integral part of the MAR AZUL Resort. We have a lovely heated swimming pool, well-equipped gym, jacuzzi, saunas and steam-room. 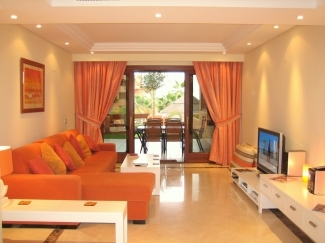 Because MARAZUL faces South, the apartments have glorious sea-views and receive their full share of the Sun. 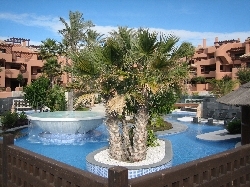 My raised ground floor apartment is perfectly located literally a stone�s throw from the beach, and only five privacy steps up from the central pool area. The views over the gardens, the pools, and the deep blue Mediterranean Sea beyond are spectacular. Watch the fisherman pulling nets into their boats from the comfort of your own bed ! Europe�s finest microclimate played a leading role in the design of the spacious lounge and master bedroom, both of which feature full-width and full height African-Teak-framed glass sliding doors, utilising reflective 'privacy' safety-glass, and incorporating mosquito-net curtains. 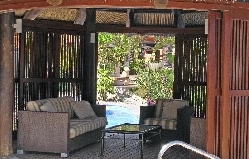 Both of these sliding doors lead out onto our extensive sun-drenched terrace and private manicured lawned area, complemented with a top quality outdoor dining table, 6 comfortable chairs (2 of which recline), and 2 loungers. The perfect place for alfresco breakfasts in the morning. The perfect place to �spread yourselves out� during the day. The perfect place for a romantic candle-lit dinner in the evening �till late. The large area provided by the terrace and our private lawn can be rendered 'child-friendly' by the easy erection of the provided trellises to cover the openings in the front garden fence, and a gate to guard the steps down to pool-side. A 42" plasma television & Satellite channels complete that picture. The kitchen has been designed with the finest attention to detail. The Siemens dishwasher, washing machine and tumble-dryer are nowhere to be seen, but they are eventually discovered hidden behind beautifully sculptured cupboard doors and under granite work-tops. The almost decadent use of the highest quality marble on floors, walls and surfaces in both bathrooms enhance their clean, crisp, and elegant design, complemented by frosted-glass privacy screens and bidet in both. The main bathroom boasts of a hydro-massage shower in a perfectly-matching marble cubicle, additional rinsing shower over jacuzzi bath, and �his & hers� wash-basins. The underfloor heating makes it a pleasure to use these bathrooms at all times of the year, and ensures quick drying of towels ! Additional deluxe features such as vast electrically heated mirrors ( which never steam-up ! ), sunken halogen lighting, and ceiling speakers, ensure that there�ll be no rushing the ladies out of these bathrooms! MARAZUL is a thoroughly safe & relaxing oasis on a lively coastline, and we will keep it that way at whatever cost to our community. Our 24 hour security guards, video security system, magnetic key-card entering system, front door peep-hole, underground car park with remote-controlled gates & doors, silent hydraulic lift from garage, and safety deposit box in master bedroom, all combine to maximise that feeling of safety and well-being here on MARAZUL. 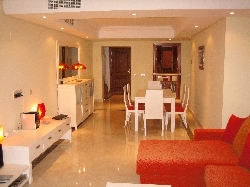 Price includes electricity, Wifi, unlimited access to indoor leisure club, cleaning etc. I am happy to negotiate discounts for extended Winter holidays. I am happy to negotiate low-occupancy discounts too.